After inheriting a house in Seattle, Jax O'Connell is living the life of her dreams as a glass beadmaker and jewelry designer. When she gets an offer to display her work during a bead shop’s opening festivities, it's an opportunity Jax can't resist—even though Rosie Perez, the store's owner, is the surliest person Jax has ever met. The weekend’s events become a tangled mess when a young beadmaker is found dead nearby and several oddball bead enthusiasts are suspects. Jax must string together the clues to clear her friend Tessa's name—and do it before the killer strikes again. Win an eBook copy of this cozy mystery (ends 11/2). Winner will receive the eBook from the author's publicist, Booktrope Publishing. Question for Janice: When you start a new book, do you have all the characters in place and an ending planned, or does it come to you as you write? First in a series, and I can hardly wait to read it. I love a good mystery book and this looks good. I'm following Janice Peacock on Goodreads & have added High Strung to my "Want to Read" shelf. Thanks for introducing me to this author, sounds like a good story! I have only recently started reading these types of mysteries and I love them! Thank you for the chance to win! This sounds so fun! I love a good mystery. It fascinates me how authors can create these worlds where readers are completely transported. Keep the great work coming! Sorry to be such a slow poke in responding. Hi everyone! 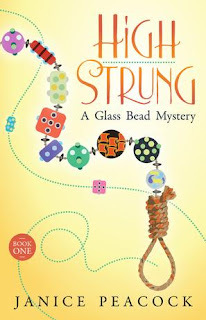 Thanks for your interest in High Strung, A Glass Bead Mystery. I hope that some (all!) of you get a chance to read it. Peggy, to answer your question...When I start I book I have some basic things figured out: who dies, how they die, who kills them, and why. From there, I have my main characters Jax O'Connell, her feisty friend Tessa, and Jax's neighbor Val, and the there are secondary characters who I develop as I write. I write most of my books during National Novel Writing Month which is November each year. During November (Yikes -- it's time to write a novel!) I commit to writing 50,000 words. During that frenzied month I just sort of spew the whole book out: Jax and her friends go on adventures, solve mysteries, drink coffee, and Gumdrop the cat causes some havoc, all driving toward the conclusion and the killer being revealed. I've written three books this way and in each of them I've had moments where I said, "Wow, I didn't think *that* was going to happen!" Stay tuned for the next book in the Glass Bead Mystery Series, "A Bead in the Hand." If you "Like" my author page on Facebook, I can make sure you get updates about my future books. www.facebook.com/janicepeacockauthor. I love a good mystery. I hope I get to read this one. Janice, thanks for stopping by and answering question. How neat that you wrote this novel during NaNoWriMo. That is very inspiring! This is interesting, with lots of good ideas!